Complete the online ITNA in collaboration with your supervisor. When emailed your Individual Development Plan (IDP) is ready in E-Track, review it with your supervisor and select interventions to address your objectives. 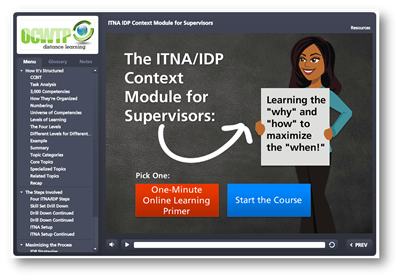 While not required, the OCWTP strongly recommends individuals and their supervisors complete the one-hour online ITNA/IDP Context Module prior to completing their first ITNA/IDP. To learn more about the ITNA/IDP steps, click on the tabs in the left-side menu above or simply scroll down. This one-hour distance learning provides foundational information about individual needs assessment and development plans within a competency-based training system, so you can maximize each of the steps involved. While it is written primarily to guide supervisor participation and involvement in the ITNA process, its content is appropriate for both parties. We strongly recommend individuals and their supervisors complete this module BEFORE collaborating on their first ITNA/IDP process. If you DO NOT NEED to receive credit or simply want to review all or part of the course, you can launch the course by clicking on the link below. The Caseworker and Supervisor ITNA Process Is Now Entirely Web Based! The OCWTP's new ITNA process is completed online via Survey Gizmo. Plan to allow yourself approximately one hour to complete it in collaboration with your supervisor. While we strongly encourage single-sitting completion, you will be able to save your progress and complete it later, if necessary. You will be required to review your draft selections with your supervisor prior to submitting your ITNA for processing. Ready to begin? Not your first ITNA? Check out Tips for Completing Your Next ITNA/IDP. Your ITNA Helps Us Help You! 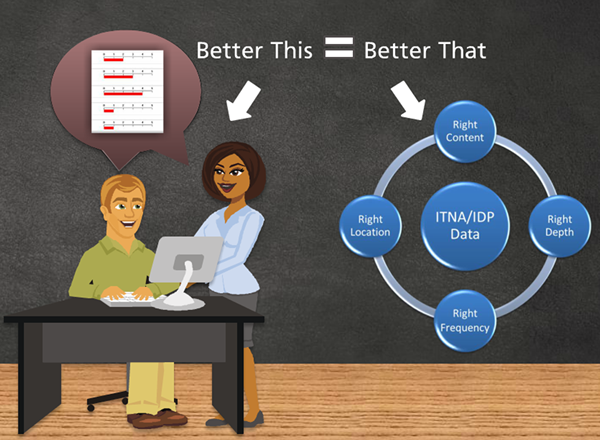 The data you provide in the ITNA/IDP process is essential to ensuring your developmental needs are addressed. We regularly review E-Track data to determine the highest priority training needs in a single county, a region, or the whole state. This data helps us determine high-priority content areas needing development, the level of depth required for learning interventions, the frequency with which interventions are needed, and the locations in which to schedule them. The more accurate your data is, the more accurate we can be in delivering the right training at the rights time and location to meet your needs. Use Your E-Track IDP to Chart Your Development Path! Consider (with your supervisor) adding independent study, shadowing, coaching, and other custom-designed learning interventions to address your specific learning needs.